Creating photo collages can be a nice way for recording the special moments and memories in life. There are plenty of photo tools available for you to achieve that. 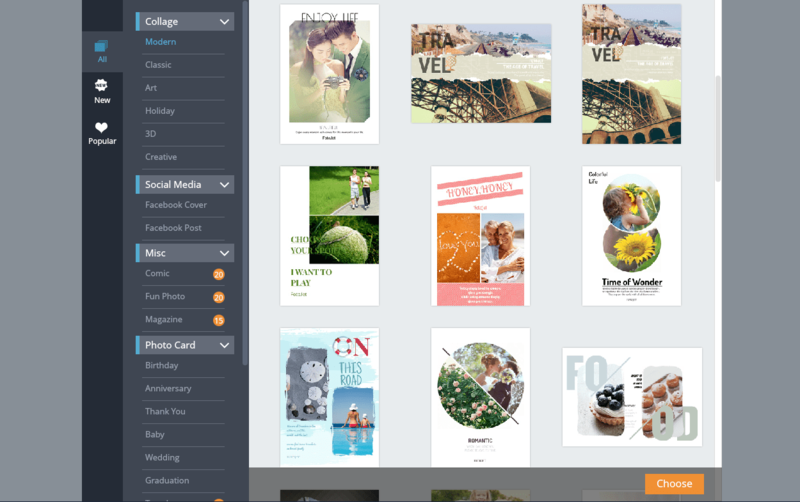 FotoJet Collage Maker developed by Pearl Mountain Technology Co., is a never-miss-out online tool that should be added to the list of your options. Using FotoJet is really easy. There are no complex settings and the whole interface is very intuitive and user-friendly. Getting started with FotoJet is as easy as clicking a button and selecting a template; no registration or download is required. FotoJet prepares a large assortment of delicate designs on its template page, all of which deliver endless collage ideas for you! There are categories you can choose from like Modern, Classic, Art, Creative and even 3D templates. There are also categories offered for photo cards, in which almost all occasions and popular holidays such as Anniversary, Baby, Wedding, Birthday, Valentine, Halloween, Christmas, and Easter are covered. You can even find gorgeous designs for Facebook cover under the Social Media category. The default size of all those designs is 851*315 pixel, which is the exactly proper size for uploading as a Facebook cover. FotoJet also keeps the profile place in mind by preserving non-editable area in the left corner. There is a Misc category composed of Comic, Fun photo, and Magazine templates, from which you can design yourself to be a famous magazine cover star or to become a wanted man, an astronaut, a medieval knight, a beautiful fairy and any other character you will think! As you will see, FotoJet has a very simple drag-and-drop interface, making it easy to upload photos from your hard drive or from Facebook and then drag them to the place you want them. It’s just a simple case of exchanging photos between different frames with ease. You can freely zoom and move a photo to make it fit properly within the frame. Other tools include rotate, flip, mirror, filters and color adjustments. With just a few clicks, your photos will be perfectly arranged in the collage. In addition to the abundant templates, various classic collage layouts are also provided under its Classic Mode. You can unleash your creativity to design a completely personalized collage. The arrangements of each layout can be easily changed with drag and drop feature. Best of all, you are allowed to apply dozens of clip-art images and set custom background for your collage layout. There are also many beautiful text samples for you to choose. Text can also be edited with your own and adjusted with different font, color, size and effect. When you get a final satisfaction,you can then save your collage as a copy of JPG/PNG image on your computer or share it directly to your Facebook and even decide how large it should be. 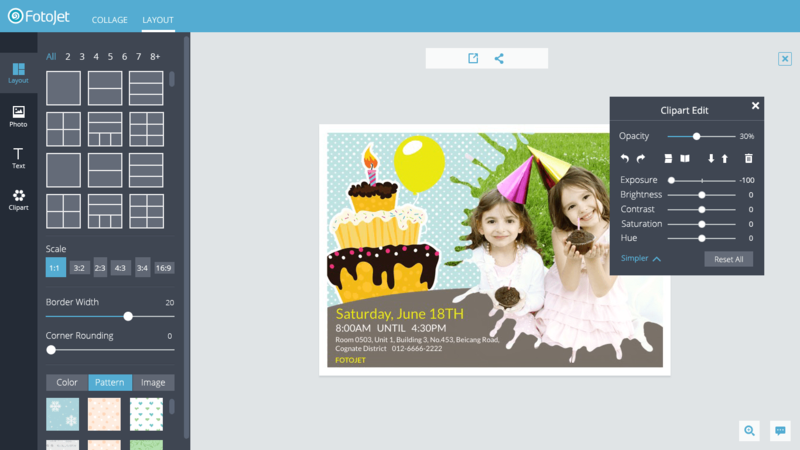 Overall, FotoJet is a simple and quick collage maker that works flawlessly in my browser. With FotoJet, not only photo collages, but also photo cards, posters, fun photos and social media graphics will be made! There is no limit to what FotoJet can deliver! I love it very much and I believe you guys will also like it. This website is so good and Relevant!! Finally I have found something which helped me. Cheers!